– Q – My cat pees everywhere and on everything! He’s been doing it years now. I thought he would break out of it eventually, but he continues to do it. He pees on my clothes, my school papers, and now he’s peed on my records and I’m fed up. I seriously thought about throwing him out and leaving him to fend for himself. I am at my wit’s end! I’ve tried physically reprimanding him, I’ve tried isolating him, I’ve tried everything! Now I am just trying to keep from seriously hurting him; what do I do? Throwing him outside will solve your immediate problem, but then you will have your conscience to live with. Have you taken him to a Vet to see if there is a medical reason? Please explore these alternatives before you do anything drastic; after all, if he has been doing it for years what’s another few weeks or months to try and correct the situation? 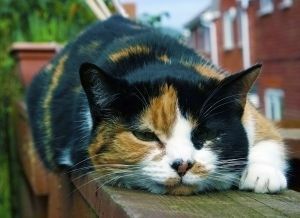 – Q – I currently have a cat with FIV who I am having put down tomorrow. How long can do I have to wait & is there any pecautions that I should take when I get another cat? – A – “Feline immunodeficiency virus is fairly unstable outside the cat and will not survive for more than a few hours in most environments. 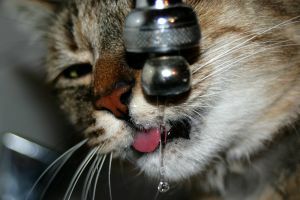 In addition, transmission of FIV occurs primarily through bites, so a waiting period between cats is not required to prevent FIV infection. 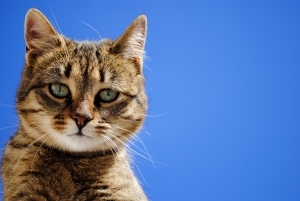 However, FIV–positive cats are frequently infected with other infectious agents which may pose some threat to a newcomer, so precautions should be taken. Thoroughly clean and disinfect or replace food and water dishes, bedding, litter pans and toys. A dilute solution of household bleach (4 oz. bleach in 1 gal. water) makes an excellent disinfectant. I know it is always hard to lose a cat that has been a member of your family and our hearts go out to you. I hope you find solace knowing your cat will be in no more pain or suffering from this debilitating disease. Also, understand this is a very sneaky disease, masking it’s symptoms until it is usually too late for treatment. Hope this helps.